RSG Consulting is the founder of the FT Innovative Lawyers programme. It continues as the content and research partner to all aspects of the programme globally. 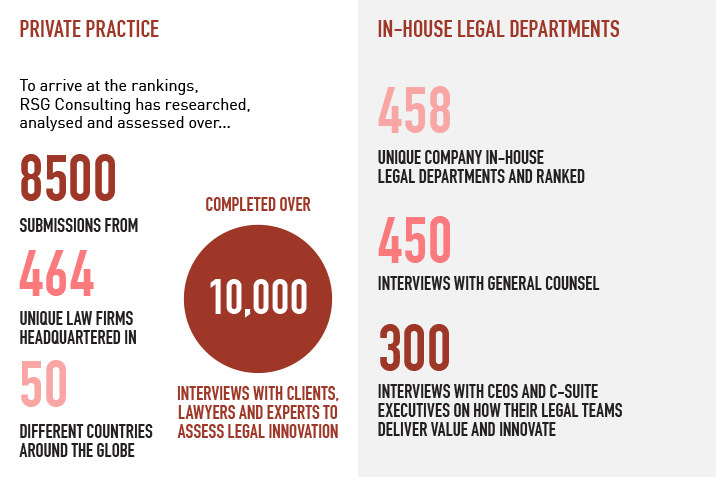 Together with the FT, we have been driving change and innovation in the legal profession since 2006. We were the first to recognise the importance of innovation for lawyers at a time when only two law firms in the UK mentioned it on their websites. Now it is ubiquitous. Most major law firms’ and legal departments see it as a critical plank of their strategies. We believe we have had a major role in raising the importance of innovation in the profession globally. Our unique analysis sought to recognise leaders in the legal industry by the value they deliver to clients, their people and society. We deliberately eschewed conventional metrics such as size, revenue and profit to focus on firms who were both successful and forward-thinking. We believed that the profession had to change and needed to recalibrate its notion of value to its clients and for itself. The figures in the map give a picture of engagement levels with the profession as of March 2017. However, as each report is published, these continue to grow.